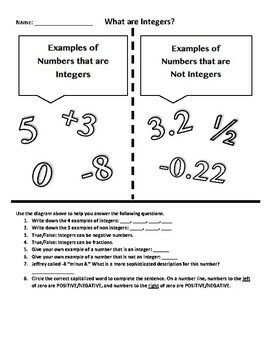 This two-page resource introduces integers by examples and asks kids comprehension questions to ensure they understand the idea of an integer. 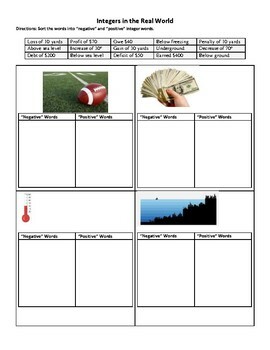 Then, students are asked to sort words/phrases into 4 real-world categores (money, football, sea level, temperature) so they can access the purpose of integers in the real world. This can be full-class instruction or self-directed practice. Providing students this at the beginning of our integers unit helped solidify the meaning of a negative number, thereby decreasing the intimidating aspect of this new concept.